Sometimes, it can be hard to talk about yourself. Personally, I’ve never found that to be the case. I love to share and tell people stories – whether it’s about my life or feelings or whatever. I’m more than just my anxiety, I’m so many other fantastic things. 1. I’m Erica. 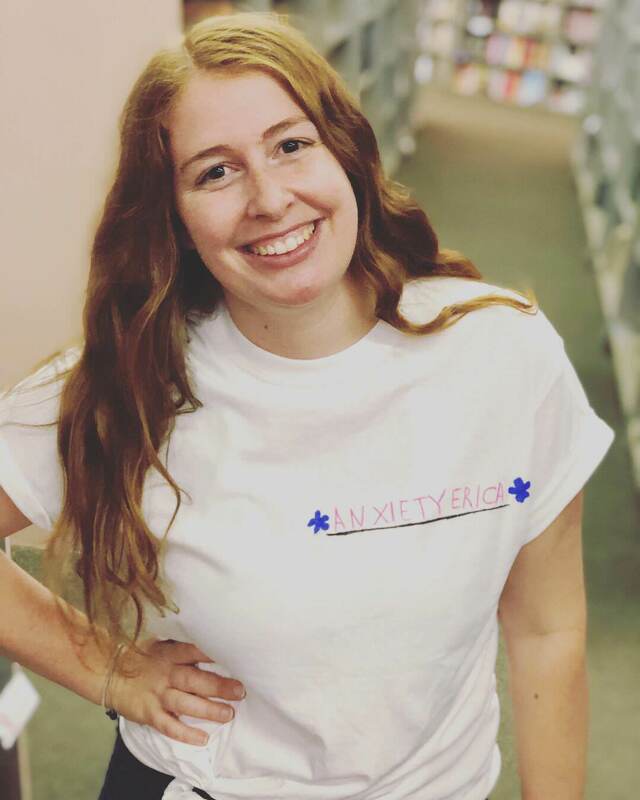 I’m a 26 year old copywriter working at a PR firm and I have GAD or generalized anxiety disorder. I’ve been in therapy for a little over a year now and it’s changed my entire life. I’m grateful to have the safe space twice a month and to learn and grow with such a supportive therapist. 2. Some of the main issues I have with my anxiety are personalizing, extreme ruminating, and being constantly afraid of conflict or becoming a burden. I work on them every day. 3. For those who know me, I love avocados more than most people. Okay, more than all people. 4. I have an ESA (emotional support animal) in the form of an 11-year-old floof man. He’s a Chow mix named Gussie and he’s my entire life. Blog post to come on the benefits of ESA’s for anxiety and mental health. 5. I cry when I watch acceptance speeches. The Oscar’s are a rough time for me. 6. I’m pretty much a huge nerd. When I’m not obsessing over graphic novels, my boyfriend and I live at the game store near my house and constantly play Hero Realms. 7. More recently, I made the decision to get my own studio. It was probably one of the best decisions I’ve ever made. Self care goes a much longer way when you can do it in the comfort of your own home. I’ve been learning to be more comfortable with being alone with my thoughts, and having my own studio is great practice for that. 8. Books are my passion and solace. The bookshelf in my studio was the very first thing I set up. Reading will forever be my home. Welp, that’s some trivia about Anxiety Erica. Hope you enjoyed learning about me! We aren’t just our anxiety, we are so much more. Let’s get to know each other – tell me something about yourself! Books and graphic novels<3 what graphic novel would you recommend? You’re my new favorite, Scarlet! Oh man, you don’t wanna get me started on suggesting graphic novels. You asked for this. I just realized the author of Paper Girls and Saga is Brian Vaughan. Since I enjoyed Runaways and Y: The Last Man I’m excited to read the other series. Added the rest to my kindle list. Unfortunately I don’t have the space to collect physical books anymore. Boo. Yay please let me know what you think when you read them! Yes, Brian Vaughan! I’ve wanted to read Y: The Last Man for awhile, glad to hear you enjoyed it.